My area of the US, the Pacific Northwest, has a good supply of nature-themed black metal bands with a sensitive, New-Age side, but it certainly isn't limited to just this region. For instance, there's a band with the rather un-metal name of Woman is the Earth (there are no women in the band), hailing from South Dakota, who released an album in this vein called This Place That Contains My Spirit in 2012. Now they're back with a remastered version of it, which is definitely better than the low-fi version to which they were restricted before, although it still contains some weaknesses. The initial synth in the title track, combined with the name of the band, made me afraid I was reviewing a Nest album or something, but as soon as the tremolo guitars start up, the sound goes to almost straight black metal, with some synth keyboard to help out at times. Jon Martin's vocals are in the "lost, despairing shriek" end of the spectrum as opposed to Bathory-style rasps, but they are still pretty standard fare; the overall composition is good, but the ambient nature of the album makes background music out of every song, though I get the feeling that that was intentional. Though it's pretty clear that the band's been listening to a lot of Wolves in the Throne Room, in some ways this reminds me of an American version of a Temnozor album, especially due to the flat, compressed sound of the drums on on tracks like Bird Song, and the way their guitar riff repeats again and again to the background of synth buried far down in the mix. Indeed, being buried far down in the mix seems to be a fate shared by most instruments except the guitar -- and even then, it's is more of a dim scraping in songs like Sage Moon than an aggressive sound. But although the bass drum is so muffled it sounds like somebody beating on a carpeted floor, the snare and cymbals, at least, can hold their own a little better; the keyboards get along by merely being a background for the guitar. 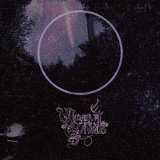 This is one of those atmospheric black metal albums that one can listen to late at night and fall asleep to, with the riffs blending into each other noisily but somewhat gently, like waves crashing on a beach, but unlike some of the more repetitive atmospheric acts, Woman is the Earth can at least dish out a decent supply of heaviness. This doesn't last. Halfway through the final track, Glow Beyond the Ridgeline, the band replaces the former metal with ambient whisperings and hums, which is supposed to add atmosphere, I'm sure, but at another eight minutes seems excessive. This Place That Contains My Spirit is not as bad as I feared it might be, but isn't amazing either, though it's still a hell of a lot better than listening to an album with less emphasis on metal. Listeners of nature-oriented metal like Wolves in the Throne Room or Fen are probably going to find some value in listening to this one, however.